The Strand will soon gain a much-needed beauty salon that will bring a new edge to downtown. Strand Salon, set to open May 1st, aims to embody a very cozy, Audrey Hepburn meets Austin feel, with vintage décor and top of the line equipment. They will offer a wide variety of hair and waxing services, along with an assortment of refreshments for the clients to enjoy while they are getting pampered. “My goal for Strand Salon is to provide both an excellent, well executed service, as well as, a fun, relaxed, traditional beauty shop type feel, bringing style and culture back into the salon” says owner and stylist, Sophia Stavnes. Sophia has handpicked three additional stylists to work along side her, who are all extremely talented and experienced in their field. Sophia’s inspiration to open Strand Salon came from her years in the industry listening to her clients and peers desire for a salon which still offered the quality of service that the high-end spa salons provided, without sky high prices. “I want my clients to walk in feeling comfortable, eager, excited and confident in their stylist, and then leave confident in themselves, rejuvenated and fabulous!” explains Sophia. Strand Salon is located in the Old Galveston Square Building, 2211 Strand, Suite 107B, behind The Admiralty and Rocky Mountain Chocolate Factory. Strand Salon will be open Monday – Friday 10am to 8pm, Saturday 10am to 7pm and Sunday 11am to 6pm. For more information and updates please visit www.strandsalonTX.com and www.facebook.com/StrandSalonTX. Mitchell Historic Properties oversees Galveston properties owned by the Cynthia and George Mitchell family, including three hotels, The Hotel Galvez & Spa, The Tremont House, and Harbor House Hotel & Marina, as well as, commercial and residential properties located downtown and at Pier 21® along Galveston’s historic harbor. The Mitchell’s ongoing preservation of Galveston’s historic downtown helped spark the resurrection of The Strand National Historic Landmark District and Pier 21® as a tourist destination. “The Mitchell family shares a deep appreciation for Galveston’s heritage,” said Grant Mitchell, President of MHP, “and we remain inspired by the vision of my parents. The buildings they saved speak to us as much as they did to them. My family is firmly dedicated to preserving my parents’ legacy.” For leasing information, visit www.MitchellHistoricProperties.com or call (409) 761-4110. 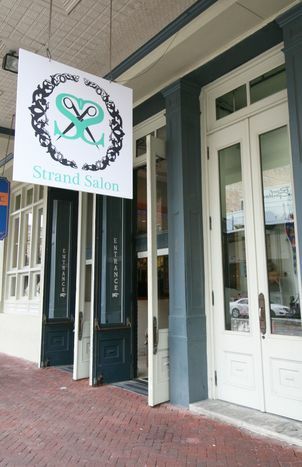 Strand Salon is located in the Old Galveston Square Building, 2211 Strand, Suite 107B, behind The Admiralty and Rocky Mountain Chocolate Factory. Strand Salon will be open Monday – Friday 10am to 8pm, Saturday 10am to 7pm and Sunday 11am to 6pm.